Thin structures were existing from the ancient time. From observations of the nature the people understood that thinner means lighter, but stiffness and stability problems arose. This was the starting point for the elaboration of theories analyzing these structures. At that time applications were limited to civil engineering. At present they are used in aerospace engineering as basic elements. Such structures are applied as a model of analysis in other branches too, e.g. mechanical engineering. With the necessity to substitute classical material by new (advanced) materials—instead of steel or concrete, now laminates, foams, nano-films, biological membranes, etc. are used. The new trends in applications demand improvements of the theoretical foundations of the plate and shell theories, since new effects (for example, transverse shear or surface effects) must be taken into account. 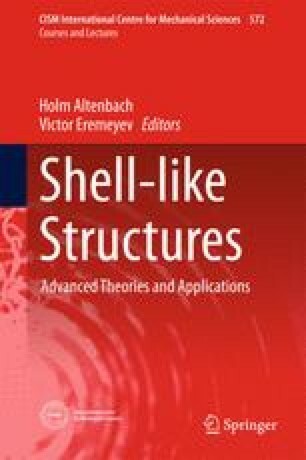 This contribution is mainly an introduction to the CISM-Course SHELL-LIKE STRUCTURES: ADVANCED THEORIES AND APPLICATIONS. After some introduction to the history some examples concerning new applications are discussed. After that main directions in the theory of plates and shells are presented. Finally, various advanced theories are briefly introduced. Other advanced theories are presented in the following chapter.